We interviewed Kevin and Chelsea, two high school sweethearts whose paths split apart but ultimately intertwined in the end, to get the story behind how they met, how they felt and the ring that made it final. Kevin and I met in high school in Sacramento, CA – he was 16 and attended the all boys, Catholic high school. I was 17 and went to the all girls, Catholic high school (literally, we went to the schools that were inspired by Ladybird!). I needed a date for junior year homecoming, so I asked my guy friends if they had anyone in mind. They immediately thought of Kevin! Turned out, my parents did not approve of a blind date. But, he ended up going to homecoming with my best friend! All the girls got ready together at a friend’s house where all of the boys were going to meet us. Kevin was the first guy to arrive into a house full of girls. I remember giggling with my girl friends that “Kevin was here,” but no one wanted to greet him first. I first laid eyes on him as I crouched on the ground at the door of my friend’s bedroom, creepily peaking out to get the first look. I turned to my girl friends and said, “He’s cute! !” We met, hung out as group, and had a great time as friends. As the weeks passed, my friend was planning her debutant, a Filipino tradition that celebrates a woman’s 18th birthday with a group of her best girl and guy friends sorted into 9 couples. She needed another guy – so there Kevin was. We hung out for months in preparation for this big event – dancing, planning, laughing together. The rest is history! I’ll be honest – when Kevin and I first started to hang out romantically, I wasn’t 100% into him. He was SO into me, always tried to have romantic moments star gazing out of his car sunroof, and always wanted to talk! At the time, I called it persistence. Now, I call it love. We were young, being each others’ first boyfriend/girlfriend. We finished high school, went to different colleges, and stayed in different cities post-grad. During this time, we really focused on ourselves and our independent goals. Even so, he was my sense of comfort and home. As we grew up together, we faced challenges both independently and in our relationship, but we never stopped working toward us. We were long distance for 7 years until I found out I was moving to Denver to complete my doctorate program. Kevin and I had always talked about when we would have our time to be together – and this was our chance. Kevin made the leap to come with me; however, I was more afraid of what would happen to us, rather than moving to a different state without knowing a soul. We had waited so long to be together, and we had worked so well being long distance; what would happen if it didn’t work when we were finally together? From day one of living together, it was pure bliss! I would’t say there was one moment where I knew he was the one. I always knew he was it for me, even when we were in high school. I never wanted anyone else. We grew up together. We were just so comfortable (in an amazing way). But, I needed to spend more than two consecutive weeks together to know if I could spend my life with him. When we started living together, it was the small things that confirmed what I had always dreamt of – kissing me good night after I fell asleep. Hysterically laughing about a video of a bird stomping its feet. Him volunteering to do the dishes. Watching movies, cuddled under a blanket. It was just so easy. I knew I wanted to spend forever with him and I was so excited for the rest of our lives… TOGETHER AT LAST! It was day three of our trip to Barcelona. Kevin said we had dinner reservations at a nice restaurant and that we would walk through a popular park on our way to dinner. I was getting hungry, but in good spirits. We entered into this beautiful park that was packed with people! We stopped to take some selfies and to check out the monuments. As we were walking up the stairs, Kevin asked me to wait. He took a moment of gratitude for where we were, literally being in Barcelona, but also how far we had come in our relationship after being together for almost 10 years. He pulled something out of his pocket and fumbled with something behind his back. I had NO idea of what was going on. Complete denial – I thought it was going to be a joke, or a promise ring. He got down on one knee, asked me to marry him, and boy did the ugly cry come on fast! All I could say was, “Are you serious? 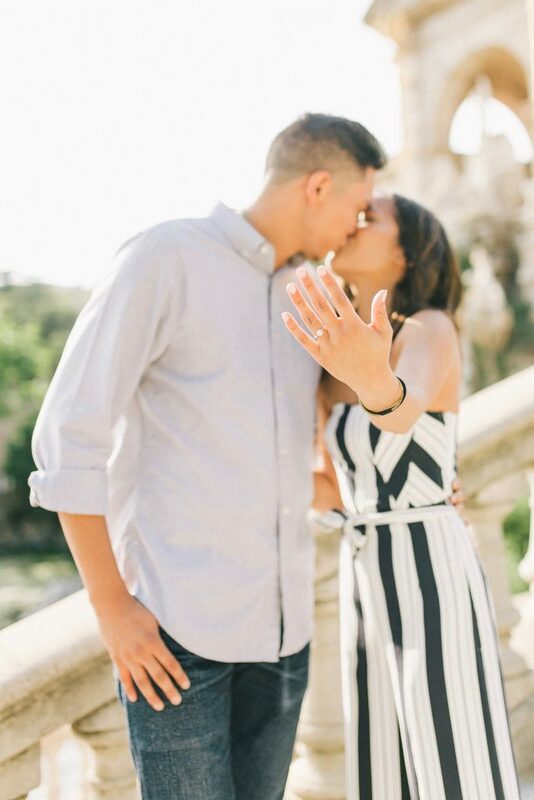 !” Of course, I eventually said yes!! It was straight tunnel vision as the hundreds of people blurred away and all I could see was Kevin’s eyes filled with tears and his bright smile. We hugged, kissed, shared OMGs. First, I heard an applause from the crowd. Then, I hear *click click click click click. * I turn to my left, and a huge camera was in my face! Kevin hired a photographer to capture the moment and we went on a 2-hour photoshoot. By the way, there was no dinner (we ate gum and mints). But, we ended the night with some tapas, champagne, and the FC Barcelona soccer game. It was perfection. 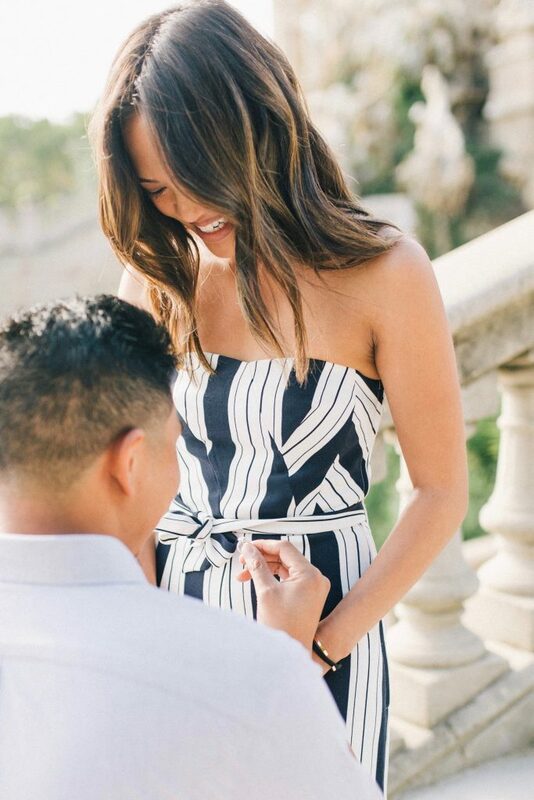 Can you tell us about the ring? Perfection!! The moment I saw it, it was the shiniest, brightest, sparkliest, most radiant thing I had ever seen in my life! When I look down at my finger, I swear it has lights in it, it is so bright. Kevin designed a round brilliant cut diamond with a tapered band of white gold and diamonds that was flawlessly executed by The Diamond Reserve. The tapered cut and the fact that it wasn’t too tall complemented my petite hand/fingers. Bonus – it was the perfect size, too! Well we actually first met when we were children. Her grandpa was a friend of our family and my family played matchmaker for him as they introduced him to my grandma’s best friend who was visiting from London. They hit it off, got married, and my family would regularly visit their house — a young me included. I’d go swimming, play with the antiques her grandpa collected, and have meals there. Little did I know the other little girl playing at the house with me would be Chelsea until we reconnected about 10+ years later in high school. There, we met through an introduction by a mutual friend. I went to the all-boy high school and she went to the all-girl high school (same one as in the movie Lady Bird in Sacramento, CA). Homecoming was approaching, and neither of us had dates so our friend suggested we go together as a “blind date”. We first spoke on the phone, made small talk, and exchanged AOL Instant Messenger (AIM) screen names so we could continue talking afterwards. Soon after the call, I looked her up on Myspace in an effort to learn more about her. I liked everything that I saw and was excited to go to homecoming together. We ultimately didn’t get to go together because her parents didn’t know me and didn’t trust the idea of a blind date (we still had no idea our families were linked until months after we met in HS), however we still ended up in the same homecoming group. I, with another girl, and she, with another boy. Despite us not going together as dates we still spoke together a few times throughout the night and constantly made eye contact. On numerous occasions we’d catch each other looking and she’d stick her tongue out and look away. It still makes me smile to think about to this day. After homecoming we were both included in a friend’s birthday celebration where we would continue hanging out together almost daily during the following summer. We haven’t stopped since. It’s hard to pinpoint a specific time when I first knew, but I’ve always had a good feeling since we were in college. We went to two different colleges about 1 hour away from each other and really only saw each other on the weekends. Despite the difficulty with the distance, we always seemed to pick things right back up whenever we were together. We were in Barcelona on a week-long vacation. Midway through the trip, on a Saturday, I told Chelsea I made dinner reservations later that night and for the rest of the day we’d take it easy by going to the farmer’s market, wandering the streets, and relaxing at the beach. I told her the restaurant would be nice and that I was going to dress in a nice oxford shirt and jeans — so she should dress nice as well. 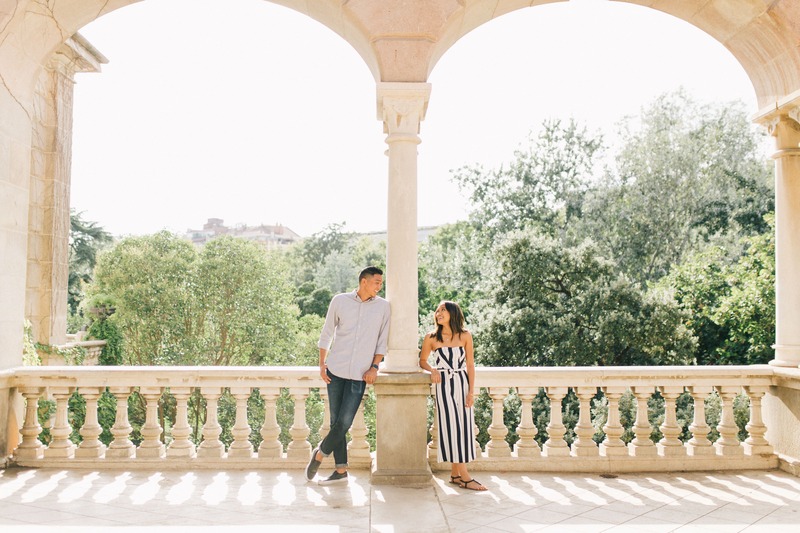 I also told her we would stroll through Parc de la Ciutadella (Ciutadella Park) beforehand as it would be nearby the restaurant. Walking in the park we came across the Cascada Monumental and I told her I wanted to take her to the top. On the way up the stairs I stopped her, said a few words of love and dropped down on one knee to ask the big question. I had tunnel vision the whole time, honestly blacked out on the words I said, tears of joy streamed from both of our faces, and there was a large applause from those nearby. Afterwards, I introduced Chelsea to a secret photographer I hired to capture the moments and we set off for a 2 hour engagement photo shoot throughout Barcelona. The ring features a round brilliant cut diamond and a tapered pave band. I wanted her to have something that matches her style, is timeless, and has a subtle uniqueness to it. It was a back-and-forth process to make sure the ring was designed just right before having Kaeleigh build it and we’re both extremely happy with the results (I even catch myself staring at the ring often! ).